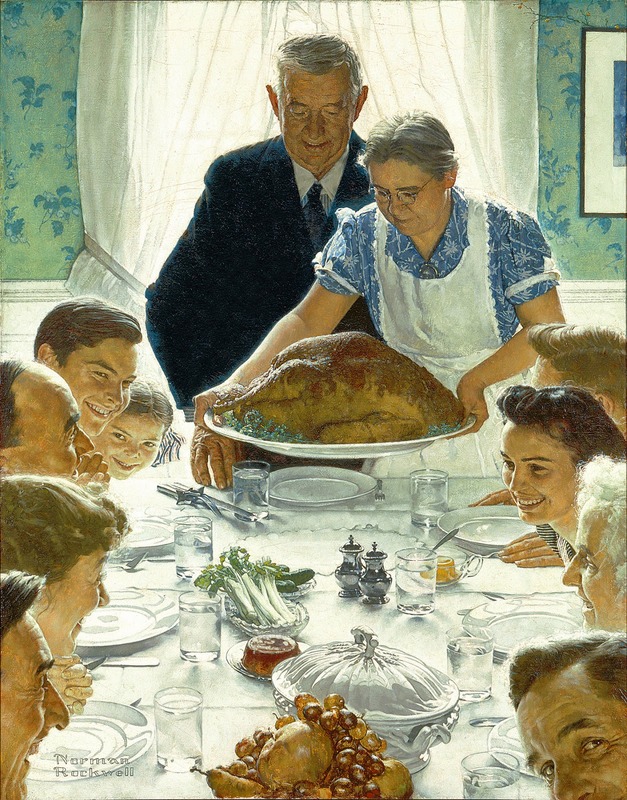 Norman Rockwell's The Problem We All Live With. This is another favorite.......your eye is led to the little girl by simply placing your darkest dark against the lightest light in the painting. She is also the only figure with a head in the scene and nothing else is the same size she is. 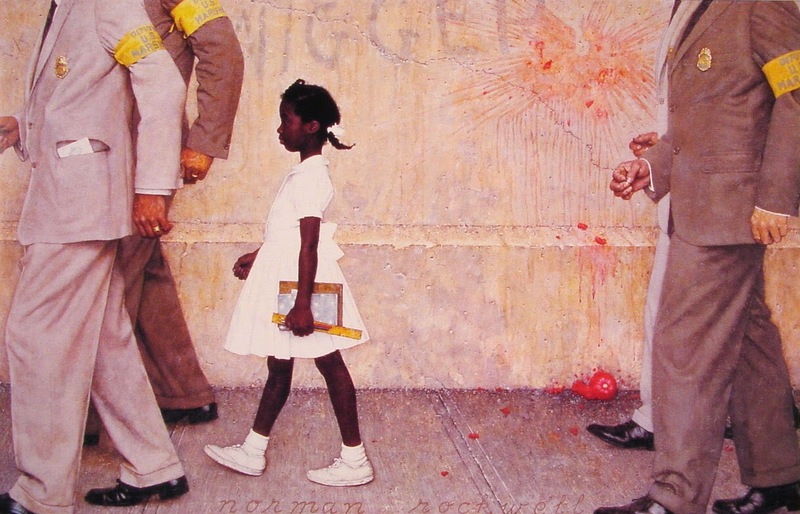 Rockwell was such a master of telling a story. 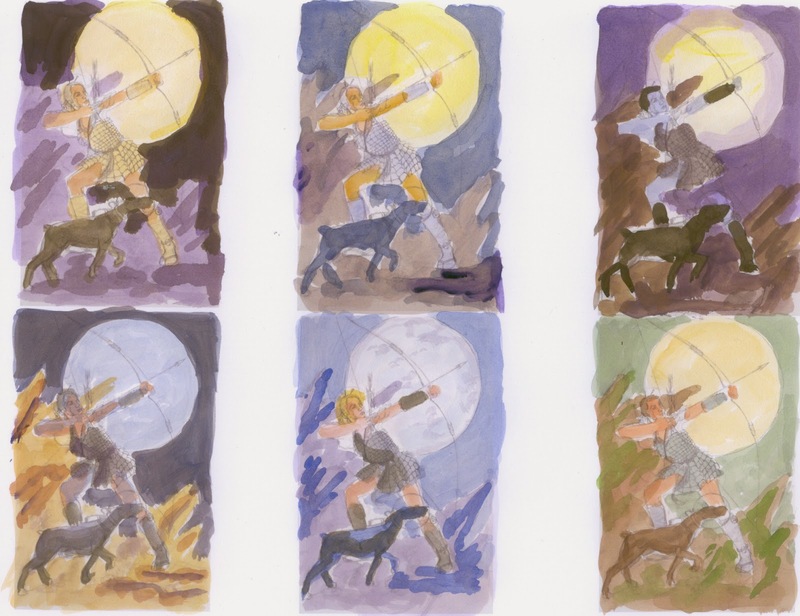 These are some of my color comps for the next piece in my portfolio. Although I understand and agree with the need for this step in the creation process, I am just not comfortable with what I end up with. I know they are suppose to be a rough idea, not polished art, but I am obsessive when it comes to my art being perfect. Color comps are supposed to help you work out your color scheme so as not to mess up the real artwork. A roadmap for success! 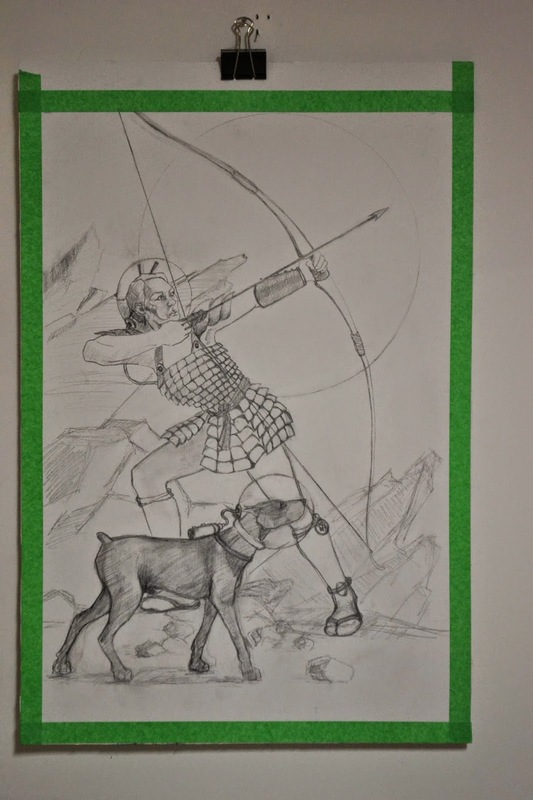 This is the sketch of my next portfolio piece. More to come. Busy is the life of an artist. I have just gotten back from Illuxcon in Allentown PA. Illuxcon is a gathering of and showing of the best artists and art in the Sci Fi and Fantasy Illustration world. It was held at the Allentown Art Museum, a four hour drive from our home here in Gore. But, Oh SO Worth it. I met up with my current teacher/mentor, Dan dos Santos and past teacher Donato Giancola. We were warmly greeted by my future teachers Rebecca Guay and Marc Scheff. The whole community of illustrators are some of the most generous and friendly artists I have ever encountered. Check out their websites for a real treat. 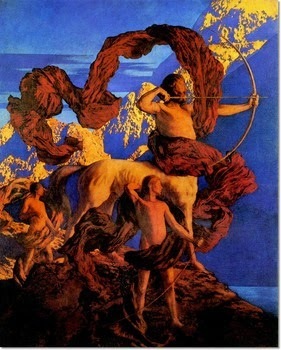 I adore Maxfield Parrish for his color....looks like stained glass! Again, look at those faces. Fabulous color scheme and composition. 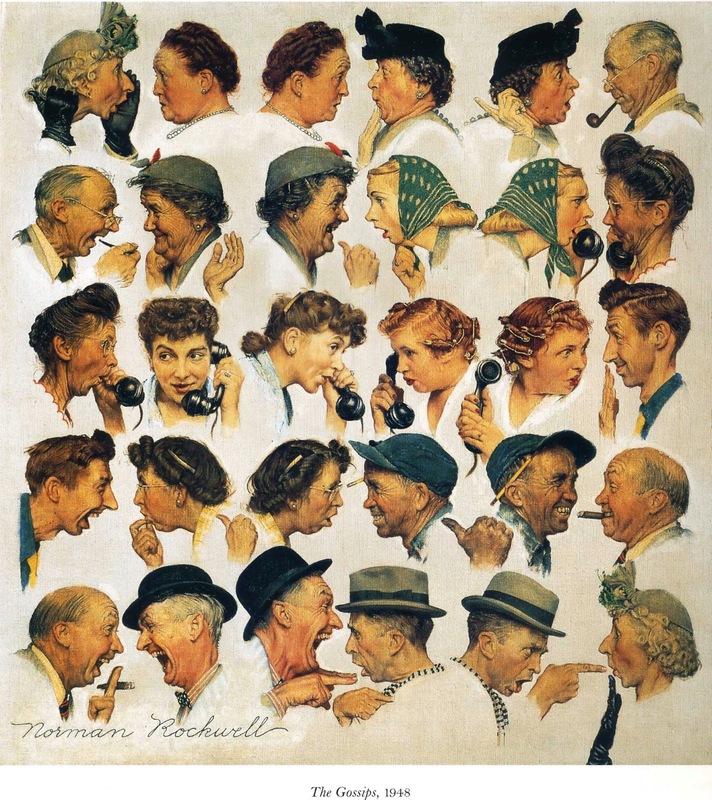 The faces that Norman Rockwell painted, were so expressive. You can tell just what is going on in the persons mind from the expressions on their faces. This is probably the reason I have always wanted to do illustration art. Instead of drawing and painting today, I am playing Princesses and Tea parties with my four year old granddaughter. I am on break at the moment, while she sets up the teaparty....so I will post some past items that I have been meaning to post, since Miss Izzie will be with us for the week. So, this little mini is about one and a half inch square. The likeness could use some improvements. Funny thing is, I always notice what I did not do correctly as soon as I post a photo of my art. But, I still love painting George W.